The ancient Greek Gods used to live in a peaceful place on a high mountain which was both idyllic and imposingly majestic. The luxurious Pantheon Villas, in Santorini island, offer the same scenery and atmosphere. The special architectural style with the fine artistic elements prevails in every corner of each building. The sense of hospitality will certainly offer guests a wonderful experience. Pantheon Villas in Santorini are an ideal combination of unique natural surroundings, luxury and tranquillity. Pantheon de luxe Villas are located in Imerovigli, the most famous place of the island due to the panoramic view to the caldera, the volcano and the rest of the island. 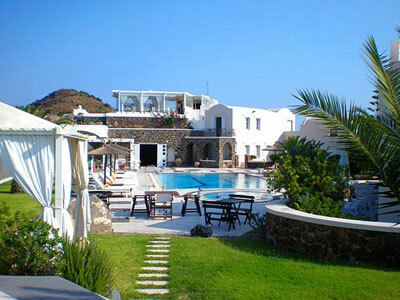 The resort is situated on the hillside of Profitis Ilias which is a unique spot as it overlooks two sides of the horizon : to the East, the Aegean Sea and to the West, the Volcano and one of the biggest Calderas of the World. Fira, the capital city is 3 km away from the villas and the village of Oia can be reached within 10' min. driving from the resort. Eros - Dionysos - Hercules - Asclepio - Hestia. These are one storey villas of about 35 sq. m that can comfortably accommodate 2 persons plus a child. The living room (with 1 sofa bed) merges to the bedroom (double bed) in one space and level. There is a kitchenette and a private balcony with a view to the Caldera. Hephaestus is a two storey villa that accommodates 3 persons and has a connecting door to the Hestia which is a Studio villa for 2 persons with a double bed. Each one has a private bathroom, a kitchenette and a wonderful view to the sea. It is a two storey villa of about 50 sq. m that accommodates comfortably 2-3 persons.There is an open plan bedroom with a double bed, a private bathroom with bathtub and a private balcony with a wonderful panoramic view to the Caldera and the volcano, on the upper floor. On the ground floor, there is a living room with 1 sofa bed, a private bathroom with bathtub, a kitchenette and a private balcony with a wonderful panoramic view to the Caldera and the volcano. It is a two storey villa of about 50 sq. m that accommodates comfortably 2-4 persons. There is an open double bed bedroom with private bathroom/bathtub and a small balcony with beautiful sea view to Caldera and the volcano, on the upper floor and a comfortable living room with 2 sofa beds, a private bathroom/bathtub and kitchenette, on the ground floor. They are two maisonettes that consist of two storey villas of about 50 sq. m. They accommodate comfortably 2-4 persons. There is an open plan double-bed bedroom with a private bathroom with bathtub and a balcony with a beautiful panoramic view to the Caldera and the volcano, on the upper floor. On the ground floor, there is a small private bedroom with one single bed and a living room with a sofa bed, a bathroom/shower, a kitchenette and a private balcony with a wonderful view to the Caldera and the volcano. It is a two storey villa of about 50 sq. m which accommodates comfortably 4-5 persons. There is an open plan double-bed bedroom with a private bathroom with bathtub and a balcony with a beautiful panoramic sea view to the Caldera and the volcano, on the upper floor. On the ground floor, there is a comfortable living room with a double bed and a sofa bed, a private bathroom with bathtub, a kitchenette and a private balcony with a wonderful view to the Caldera and the volcano. These are two storey villas of about 60 sq. m that comfortably accommodate 2-4 persons. There is one bedroom, a private bathroom with bathtub, a balcony with beautiful Sea View and a small terrace with a view to the sea and a panoramic view to the island, on the upper floor. On the ground floor, there is a comfortable living room with 2 sofa beds, a private bathroom (shower), a kitchenette and direct access from the terraces to the private swimming pools with the jacuzzi and the view to Aegean Sea. Transfers from/to airport/port are free of charge.